The "Vampire Tales" is the biggest, hungriest, undeadliest collection of vampire stories ever assembled. Dark, stormy, and delicious, once it sinks its teeth into you there's no escape. Vampires! Whether imagined by Bram Stoker or Anne Rice, they are part of the human lexicon and as old as blood itself. They are your neighbors, your friends, and they are always lurking. 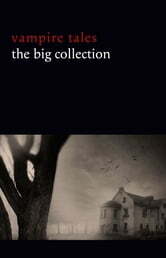 Now we have compiled the darkest, the scariest, and by far the most evil collection of vampire stories ever, with over 80 stories, including the works of M. R. James and H. G. Wells, alongside E. F. Benson and Algernon Blackwood, not to mention Walter De La Mare and Robert E. Howard. The "Vampire Tales" will drive a stake through the heart of any other collection out there. Other contributors include Arthur Conan Doyle, Richard Marsh, Ambrose Bierce, H. P. Lovecraft, John William Polidori, Clark Ashton Smith, Nikolai Gogol, and D. H. Lawrence.